Jordan Ingram reporting for FishDuck.com from the Hatfield-Dowlin Complex in Eugene, Oregon. As Oregon’s veteran defensive back and dynamic playmaker, senior Erick Dargan‘s career as an Oregon Duck began in 2011 with a chance for a national title under former Oregon coach Chip Kelly. Now the talented playmaker will bookend his impressive football pilgrimage with another shot at a title as the Ducks prepare for Ohio State in the College Football Playoff National Championship game at AT&T Stadium in Arlington, Texas. Dargan makes a spectacular tackle against FSU in the Rose Bowl. In an interview today, the Pittsburgh, CA native shared with FishDuck.com what he has learned from playing on college football’s biggest stage and how to prepare for a game of this magnitude. 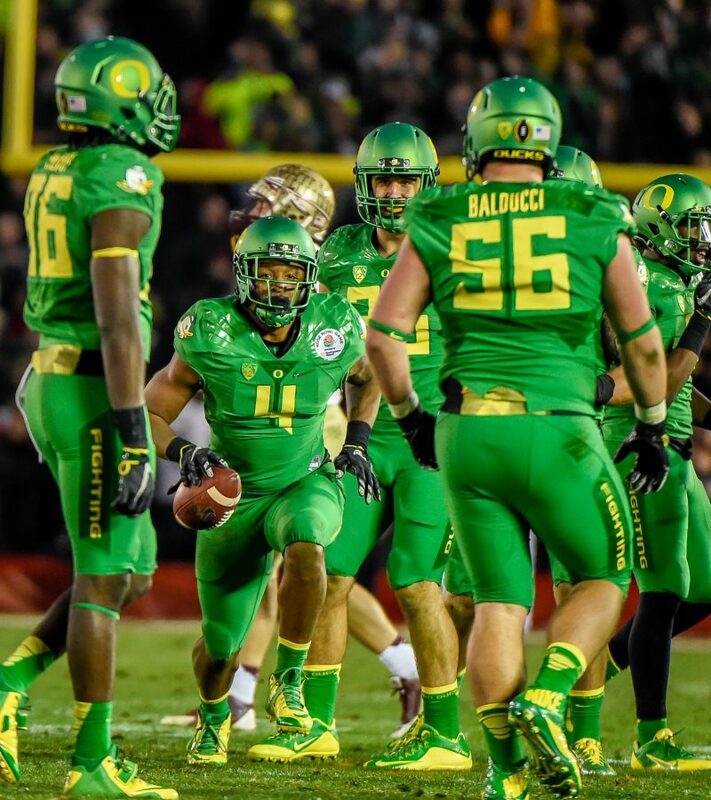 This Duck team has remained in sync all year, overcoming adversity and developing a united front as they march lockstep together toward the CFP National Championship game. But Dargan’s years of ups and downs have humbled him. As a natural leader for Oregon’s defense, he doesn’t see himself as a boss or who someone who demands respect, but rather as a brother, mentor, and friend to his teammates. 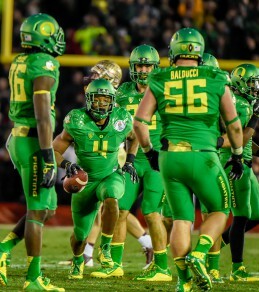 Dargan is a catalyst for this Oregon defense. “I just be myself. I understand that people need help on their side of the defense or need help communicating, and it’s my job to do it. And that’s what I tell the other safeties, too. It really falls on us and we really have to communicate the most. I just try to share what I have learned,” Dargan said. Dargan has been a source of inspiration for this Oregon defense in the regular season and into the post-season, grabbing an interception and forcing a fumble against Florida State in the Rose Bowl. “The longer you go, the stronger you get. We went longer and we stayed stronger. Everyone kept demanding more out of each other,” Dargan told the Associated Press following the Ducks’ Rose Bowl victory. It’s been a long time since that devastating BCS National Championship game loss to Auburn. But Dargan’s leadership and this Oregon defense are stronger than ever and more determined to leave everything out on the field come January 12.